I made the right call in buying Six of Crows and Crooked Kingdom at the same time. The moment I finished the first book, I picked up the next. This is the story of Kaz and his group of criminals who attempt an impossible heist. They are to break someone out of the most secure prison in the Grisha world. The journey to the Ice Court was more fun than the actual heist but I flew through this book so fast that I couldn’t bring myself to care. The one thing I really had to get used to were the Dutch names. I know a Joost and I know a Heleen (she’s one of my best friends and had a good laugh when I told her about Tante Heleen of the Menagerie). I understood the names of the bridges and canals and it all made me think of Amsterdam so that’s what Ketterdam looks like to me. There were a couple of moments where the Dutch words took me out of the story but eventually I got used to it and I found it comforting in a way. What this book (and every book in the Grisha verse for that matter) does really well is remember to give the characters ups and downs. Nothing is too easy, nothing ‘just happens’, they have to work for their achievements. Things go wrong and they have to adjust their plans. This gives the characters room to grow. All the main characters have a story to tell. Their history is told throughout the book. It makes them believable, solid. It doesn’t happen very often that I like ALL the characters. There’s Kaz, the mastermind who happens to walk with a cane. Inej is a super spy, her knives are named after saints. Nina can affect people’s feelings, her own feelings are… complicated. Matthias is a prisoner. Jesper a sharpshooter and Wylan is… Wylan. Out of the six main characters, I liked Kaz and Inej best but it’s a close call to make. They are all different and all amazing. Right now, I’m about a quarter into the second book, Crooked Kingdom, and I already know I’m going to like it as much as this one. Why four stars and not five? It didn’t take my breath away. It was really, really good but not mind-blowing. 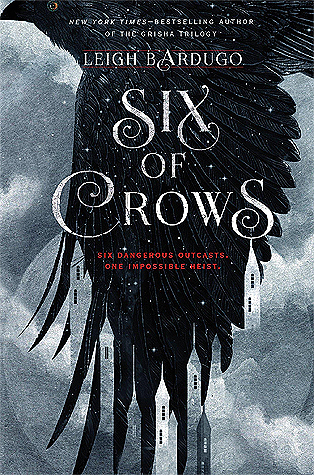 Maybe Crooked Kingdom will achieve what Six of Crows did not. Fingers crossed! It’s looking good so far.